The latest in the near avalanche of new shows with old scores known affectionately as the jukebox musical is ain't too proud:The Life and Times of The Temptations . It is neither the best nor the worst in this genre as it celebrates the legacy of five talented black singers whose delivery of the R&B catalog and "psychedelic soul" during the 1960s was enhanced by their flashy performance style. Structured along the same biographical lines of the hugely successful Jersey Boys, ain't too proud has that been-there-done-that veneer that diminishes the uniqueness that distinguished the group. Speaking of avalanche, no less than thirty-one Motown songs are performed with a slick and polished vigor but only rarely in their entirety, a decision that gives short shrift to some of the best of them. Director Des McAnuff continues to refine a formula that worked best for Jersey Boys and less so for Summer, the bio-musical about Donna Summer. Despite terrific performances by a multi-talented cast, there is a limit to the pleasures derived from Sergio Trujillo's somewhat repetitious choreography, however smartly deployed in one number after another. The individual back stories that bridge the songs of the famed quintet, supply just enough factual and personal details to give each of the performers a modestly distinguishing frame. The musical numbers loosely frame stories that appear as only obligingly perfunctory— surprising considering the book is by lauded playwright Dominique Morisseau (Pipeline , Skeleton Crew ). Even though Morisseau supplies more outline than insight, it is almost enough to appreciate and respect the group for its ambitions and its abilities, and without ignoring their various shortcomings. A narrative thread, based on Otis Williams' memoirs, is provided with an ingratiating sincerity. The real world intrudes with time-line references to touring the segregated South, the assassination of Martin Luther King, and the protests against the Vietnam War. But these seem to function largely as historical filler. The musical numbers come at us with astonishing speed and a predictable regularity, with most of them over almost in a flash. This, as we see how the group was formed in Detroit and quickly defined a style under the Motown umbrella and management of Berry Gordy (Jahi Kewarse). In succession, they lose and gain members right and left as they cope with drug addiction, abuse of alcohol, women, success, splitting up and eventually reuniting for a rousing grand finale. 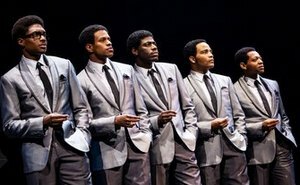 There is no lack of memorable performances: Jeremy Pope, who recently starred in Choir Boy is Eddie Kendricks, the group's constant critic; awesome falsetto; Ephraim Sykes is the extraordinarily loose and limber David Ruffin; Jawan M. Jackson is the glorious basso Melvin Franklin plagued by ill-health; James Harkness is the tragic alcoholic Paul Williams. All are individually and collectively standout. Visually, the show's color palette, with its easy flow of functional settings designed by Robert Brill, is notable for the predominance of black and grey. The only glam and glitter arrives in the burst of red and sequined rainbow-hued gowns designed by Paul Tazewell for the two numbers sung by The Supremes. Candice Marie Woods is a breathtaking Diana Ross. But so also are the Temptations, one and all in a show that otherwise leaves us invigorated if not quite breathless. Based on the book The Temptations by Otis Williams with Patricia Romanowski. Saint Aubyn(Dennis Edwards), Shawn Bowers(Dennis Edwards), E. Clayton Cornelious("Gloria" Soloist,Richard Street,	Ensemble), Taylor Symone Jackson(Johnnie Mae,Mary Wilson,	Ensemble), Jahi Kearse(Berry Gordy,	Ensemble), Jarvis B. Manning Jr.(Al Bryant,Norman Whitfield,Dnsemble), Joshua Morgan(Shelly Berger,	Ensemble), Rashidra Scott(Josephine,Ensemble), Nasia Thomas(Mama Rose,Florence Ballard,Tammi Terrell,Esemble), Christian Thompson(Smokey Robinson,	Damon Harris,Ensemble), Candice Marie Woods (Diana Ross,Ensemble).